Syed Firdaus Ashraf recounts his mission to withdraw Rs 500 notes from the bank. Mission: To withdraw Rs 500 notes. Accessories: Water bottle and chocolate to tackle low blood pressure. Book to keep me going: The Book of Embraces by Eduardo Galeano. This was the fourth time I was standing in a bank queue after demonetisation. I desperately needed change for Rs 2,000. I had a few Rs 2,000 notes, but I was yet to see the new Rs 500 note. All essential work was being stalled because of my non-digital lifestyle. Except occasionally using a credit card, I have never engaged in cashless transactions, whether through Internet banking, mobile banking or even via a debit card. Since November 8, I have been feeling like a dinosaur in a modern day Jurassic Park. My wife asked me to get Rs 500 notes from the bank because all those Rs 2,000 notes I had were of no use. No one was willing to part with change. So once again, I did what I have been doing for the last three weeks: Stand in a queue at the bank to withdraw money -- but this time, Rs 500 and Rs 100 notes only. Three weeks after the note ban, I realised there is no fatigue factor while standing in a queue at the bank. The nation demands it, so everybody obeys it, and that includes me. After all, nation first, as BJP leaders will tell you. After standing for more than an hour in the queue, I realised the story of every Indian is like that of the passengers in the film, Bombay to Goa. We stand in a queue for three hours, scream, shout, laugh, drink and sometimes eat to kill time. I was the only person busy reading a book in the queue, just like the villain in Bombay to Goa who was shown reading a newspaper while hiding a gun behind it. The villain gets bashed up in the bus by Amitabh Bachchan -- and any person in the queue who vents his anger against the Modi government will surely meet the same fate. Know, why? 'Nation First,' silly. So it's best to keep quiet and read a book. The man behind me asked, "What book are you reading?" "Book of Embraces by Eduardo Galeano," I replied. He asked what the book was about. "The politics of Latin America," I said. "Where is this country?" the man asked. I was surprised he had no idea where Latin America was, that it was not a country but a continent. I asked him, "Have you heard of a banana republic?" "No," he said. "What is it?" Politicians speak, but say nothing. Voters vote but don't elect. The military makes war against its compatriots. The police don't fight crime because they are too busy committing it. Bankruptcies are socialised while profits are privatised. The man appeared not to understand a word of it, smiled at me and kept quiet. Galeano also mentions the paradoxes of nationalism. Napoleon Bonaparte, the most French of Frenchmen, was not French. Josef Stalin, the most Russian of Russians, was not Russian, and the most German of Germans, Adolf Hitler, was born in Austria. Taking a break from my book, I spoke to a gentleman ahead of me who seemed to be a supporter of demonetisation. Modi, he felt, had taken a big political gamble. I nodded silently, the preferred option these days, especially outside banks. As the queue approached the bank's doors, pushing and shoving around began. One man shouted at another, "Why are you making me a sandwich in the queue?" But, of course, the sandwich! Whose invention is credited to the fourth earl of Sandwich who in the early 18th century is said to have created the convenience food so that he would not have to leave the table when he was gambling. I understood the correlation -- Modi was taking a political gamble and we Indians have become the sandwich. A bank staffer asked me to come inside. I went in eagerly, hoping to get the Rs 500 notes, but the staffers said they had not got any Rs 500 notes. 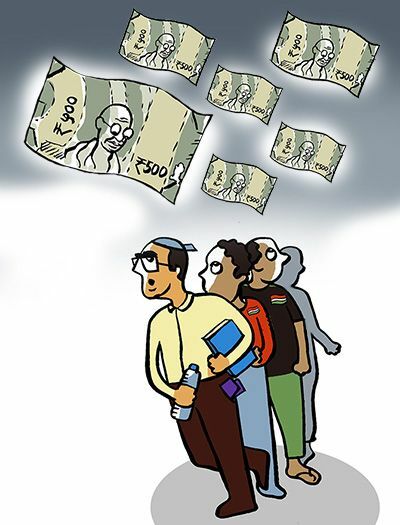 "Take the Rs 2,000 notes or leave," was the curt answer when I tried reasoning with them. My gamble to stand in the queue and get Rs 500 notes had failed. And only the months ahead will tell us if Modi's gamble will succeed or not.